Thanks to a wonderfully successful Capital Campaign, the generosity of supporters of our ministries, and other favorable circumstances we decided it is the best time to consider some renovations to the remaining residence halls, first and second floor of South Hall. Over two dozen sisters packed up and moved out for 6-7 months and the demolition phase has already begun. 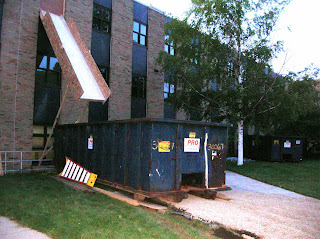 One big difference from the North and West Hall renovations: the dumpsters are in the back of the Mount building, hardly visible even from the back parking lot. The windows, of course, have already been installed and the HVAC system is in, too, so the renovations will mainly be just bedrooms and plumbing.